Although school is back in session and wearing white might be faux pas, the weather is telling me that summer isn't going anywhere. Here in Maryland, the past several days have been in the 90's. If it weren't for that low-hanging sun, I'd swear we were stuck in July. I also seem to be in a mild state of denial, wondering where all those "dog days of summer" went. But labor day is now behind us and that only means one thing…BOGO at Payless. Right, that... and also that sadly, summer really has come to an end. 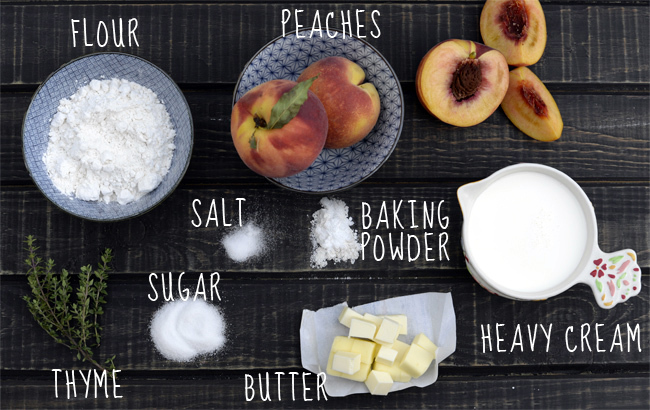 This year I refuse to go out without one last summer fling with peaches–And this biscuit recipe is just that. 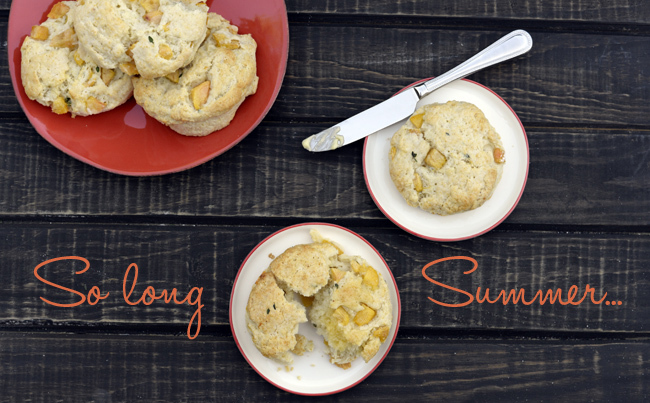 These biscuits are the perfect way to end things with the most delightful summer fruit. (Sorry watermelon, I still got love for you.) But seriously, these biscuits are good. Like, really good. 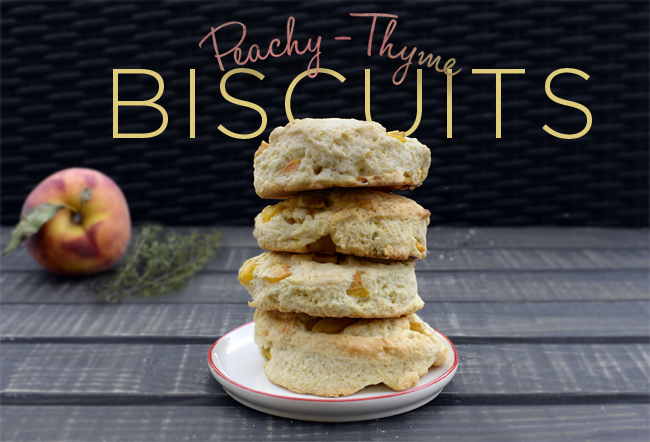 They're flaky, sweet, crumbly and packed with flavor from the ripe peaches and savory thyme. Did I mention this recipe is about as simple as they come? 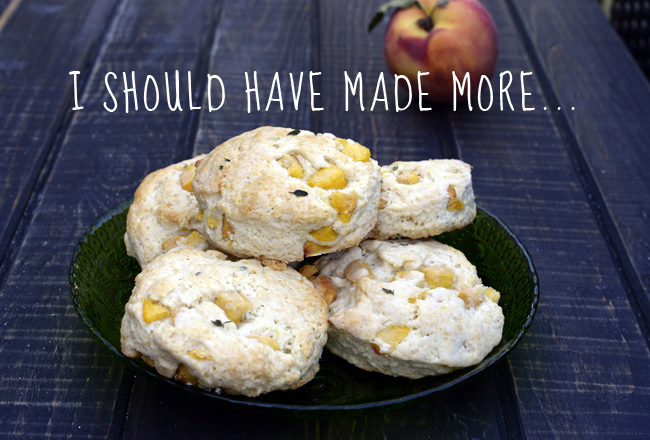 It's my simple foolproof biscuit recipe, fancied up with diced peaches. The thyme is subtle, yet adds so much to the overall taste. An early-rise for school might be difficult, but if you know these biscuits will greet you in the A.M., setting the alarm won't be necessary. 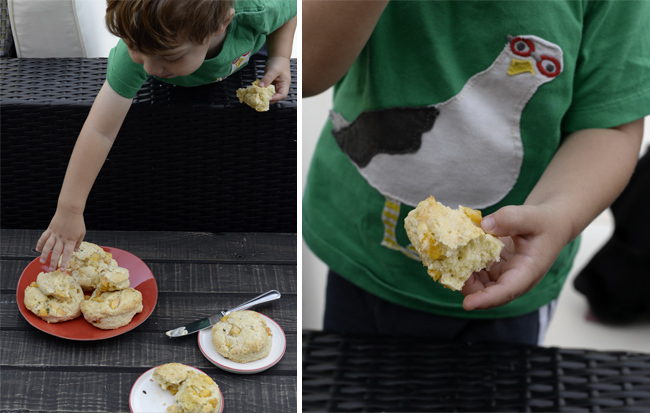 Bakers beware…This recipe only makes about 7 biscuits, so you might need to make several batches. And remember, the better quality the butter is, the better your biscuits will be. 1. 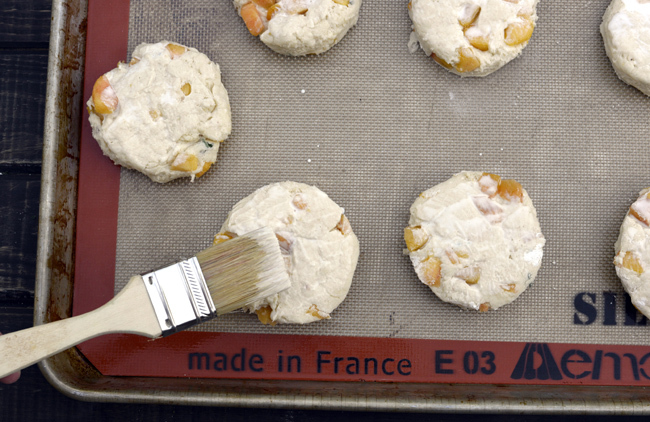 Preheat the oven to 425 degrees and line a baking sheet with parchment paper or a non-stick liner. 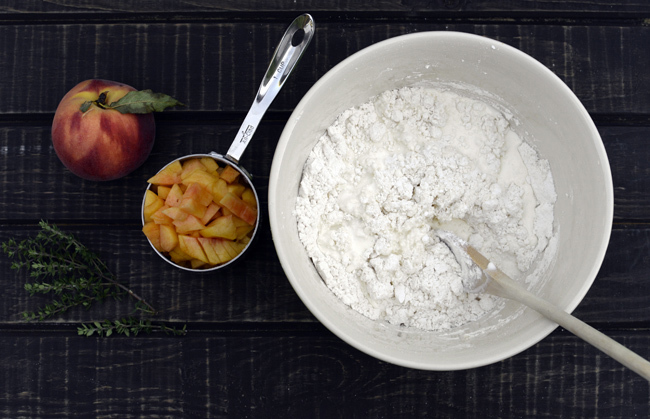 In a large bowl, combine the flour, baking powder, sugar and salt. Use a pastry blender or fork to cut the butter into the dry ingredients until small crumbs form. Slowly pour in all but about a tablespoon of the heavy cream and mix until the dough just comes together. 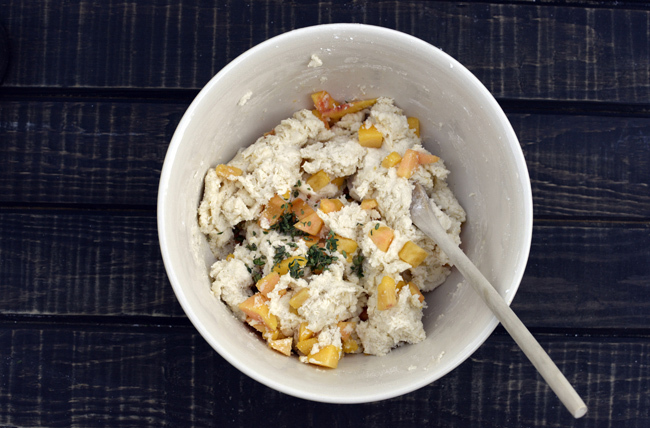 Stir in the peaches and thyme. 2. Turn dough onto a floured work surface and pat into a disk about 1 1/2-inches thick. 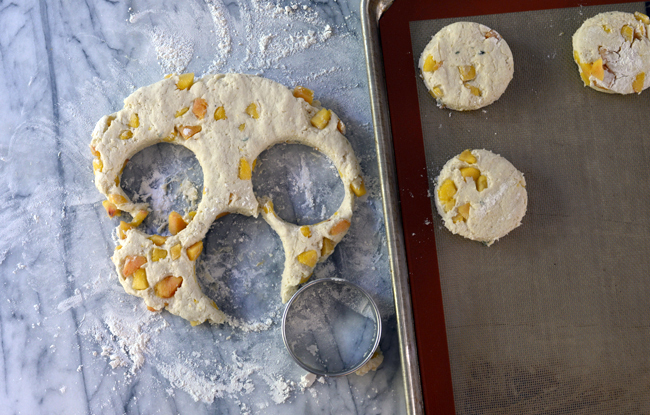 Use a 3-inch round circle cutter or a drinking glass to cut out biscuits and place them directly on the lined baking sheet. 3. Use a pastry brush to brush the remaining heavy cream on the tops of the biscuits. Bake for 10-15 minutes, or until biscuits are puffed and golden. Carefully collect the scraps to make the biscuits. The less you work the dough, the better. Top the biscuits with extra heavy cream to achieve that golden color. Then sprinkle with extra thyme leaves. This is what happened as I tried to shoot photos of the final product. Little hands can't resist. (Neither can the blurry dog in the background).